Raise awareness, raise funds, integrate marketing, and have fun! | Crossmedia451, Inc.
Raise awareness, raise funds, integrate marketing, and have fun! By now, most of you have heard of the ALS Ice Bucket Challenge. This has been a brilliant fundraiser for the ALS Association, has raised awareness for the group and the disease, and created a lot of social media buzz in the process. The individuals who have taken on the challenge represent all walks of life and professions, as well as businesses and communities. We’ve written before about cause-related marketing and this ALS effort has been wonderfully executed and a lot of fun. There are lessons to be learned for your business from this summer’s great ice bucket adventures. While your business should not be a copycat, you can create some fun for it. People enjoy doing business with other people. Faceless corporations are no fun, and do not inspire loyalty. Your business does not have to raise $50 million for a cause, either. We recently worked with three local businesses to raise money for the one that is the non-profit. In the process, brand awareness was raised for all the businesses involved. The specific idea was to create a neighborhood “mash-up” hamburger using ingredients from two separate, unrelated restaurants, Leadbelly Burgers and Gale Street Inn. 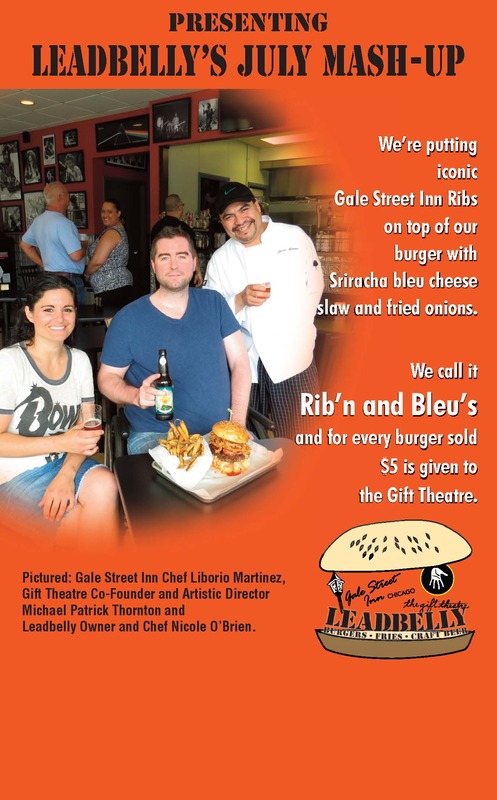 For each burger sold during July, $5 was donated to a local non-profit theatre, the Gift Theatre. All the businesses are in the same Chicago neighborhood, and all three have a vested interest in seeing the neighborhood thrive and attract more business. This idea was creative, fun and improved business all around through the good will it generated. The campaign lasted one month, and raised $2000 for the little storefront theatre. It may not be the Ice Bucket Challenge, but the amount of money has a positive impact on the theatre, demonstrates how the businesses work together as neighbors, and generates warm feelings among the guests for all businesses. Cross-marketing introduced the guests of one restaurant to the other, and introduced some people to the theatre for the first time. You can do something like this, too. Develop a plan, pick a cause, have some fun, raise some money. It’s all good. 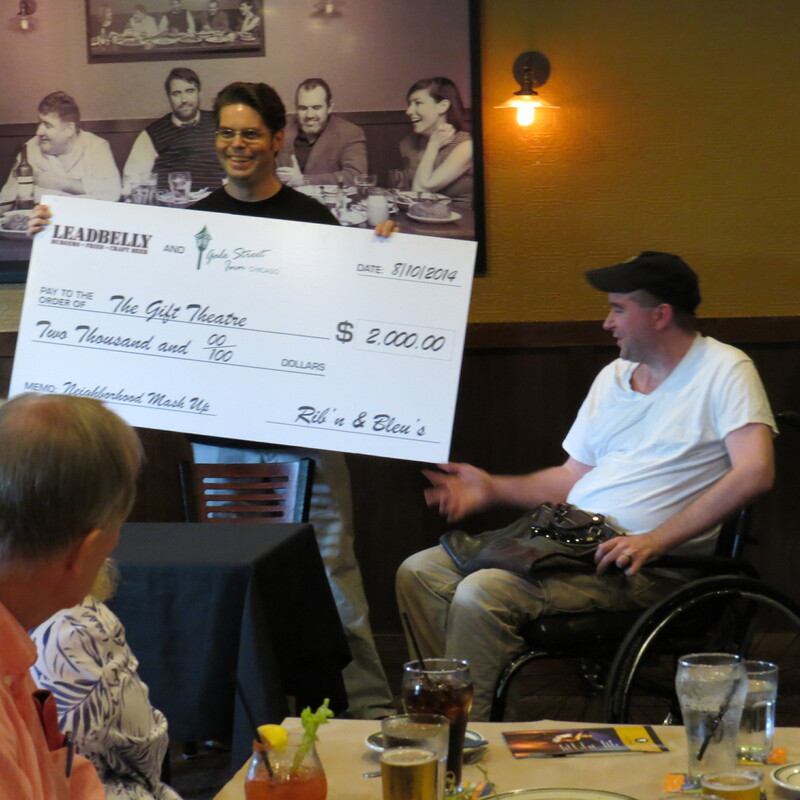 Leadbelly’s Tom O’Brien presenting a check to the Gift Theatre’s Michael Patrick Thornton after the campaign was completed. Leadbelly owner Nicole O’Brien, Gift Theatre Artistic Director Michael Patrick Thornton and Gale Street Inn Chef Liborio Martinez. This was an ad for the campaign. This entry was posted in Advertising, content marketing, cross-marketing, Local business, Lovemarks, marketing, Publishing, social media, Web sites, Writing and tagged action, brand management, business, cause marketing, Chicago, content, cross marketing, cross media, digital marketing, email marketing, Laura Gale, marketing, small business, social-media, web site. Bookmark the permalink.